Home Amihan Gale Warning Northeast Monsoon PAG-ASA Tail-End of a Cold Front PAGASA Gale Warning Update for 04 January 2018. PAGASA Gale Warning Update for 04 January 2018. As per PAGASA Gale Warning update issued at: 05:00 AM TODAY, 04 January 2018 - For: STRONG TO GALE FORCE WINDS ASSOCIATED WITH THE SURGE OF NORTHEAST MONSOON. 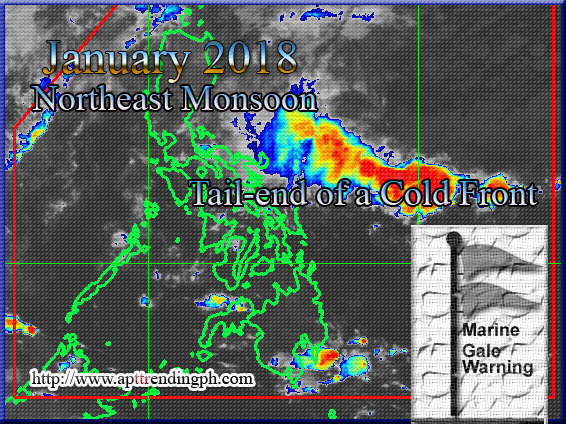 Cloudy skies with scattered rainshowers and thunderstorms with rough to very rough sea condition: THE EASTERN SEABOARDS OF SOUTHERN LUZON AND OF VISAYAS (Camarines Provinces, Catanduanes, Eastern coast of Albay, Eastern coast of Sorsogon, Eastern coast of Quezon including Polilio Island, Northern Samar and Eastern Samar). Fishing boats and other small seacraft are advised not to venture out into the sea while larger sea vessels are alerted against big waves.